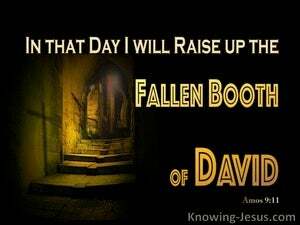 On that day I will raise up the booth of David that is fallen, and I will repair its breaches and will raise up its ruins and will build it like the days of old. 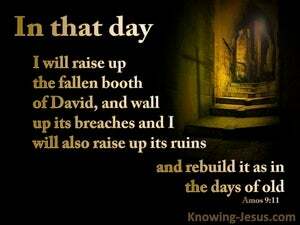 "In that day I will rebuild the collapsing hut of David. I will seal its gaps, repair its ruins, and restore it to what it was like in days gone by. In that day I raise the tabernacle of David, that is fallen, And I have repaired their breaches, And its ruins I do raise up, And I have built it up as in days of old. 10 "All the sinners of My people will die by the sword, Those who say, 'The calamity will not overtake or confront us.' 11 "In that day I will raise up the fallen booth of David, And wall up its breaches; I will also raise up its ruins And rebuild it as in the days of old; 12 That they may possess the remnant of Edom And all the nations who are called by My name," Declares the LORD who does this. Why have You broken down its hedges, So that all who pass that way pick its fruit? "I shall give them over to the power of those who are seeking their lives, even into the hand of Nebuchadnezzar king of Babylon and into the hand of his officers Afterwards, however, it will be inhabited as in the days of old," declares the LORD. "Have You not made a hedge about him and his house and all that he has, on every side? You have blessed the work of his hands, and his possessions have increased in the land. "All the trees of the field will know that I am the LORD; I bring down the high tree, exalt the low tree, dry up the green tree and make the dry tree flourish. I am the LORD; I have spoken, and I will perform it." Shepherd Your people with Your scepter, The flock of Your possession Which dwells by itself in the woodland, In the midst of a fruitful field Let them feed in Bashan and Gilead As in the days of old.